Stop being afraid of taking time off. 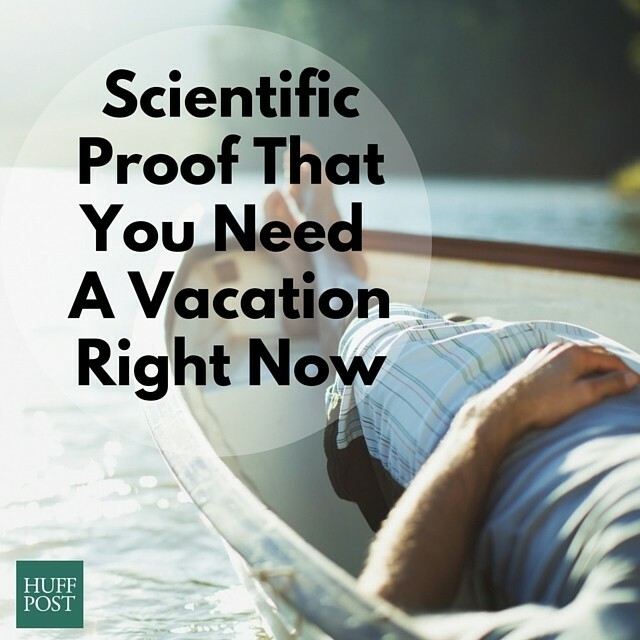 Science says vacations will make you a better worker. It's a fact now that most American workers aren't taking any vacations. Last week we reported that about 40 percent of Americans don't plan on using all of their paid time off this year. And you're probably one of them. You hoard up your precious vacation days and keep saying you'll use them, but something gets in the way. Maybe it's your workload, or, maybe, like others, you're totally scared that you're going to lose your job. The most common reason why people weren't taking vacation was because they possess what researchers call a "martyr" complex, in which they believe that no one else can do their job as well as they can. Yet more than 20 percent of people who don't take vacations say they skip out because they are afraid they feel they are easily replaceable. Whichever is the case, we're here to tell you to please, please take a vacation. We know you're afraid. But after you read these reasons why taking a vacation will do amazing things for your wellbeing and your mind, you may reconsider. And more importantly: Taking a vacation could make you even better at your job. Yes, it's true. Read on, and start booking your next flight or planning a staycation. Giving employees significant time to take a break will help them be renewed and come back to work even stronger, says Tony Schwartz, the chief executive officer of The Energy Project, in an op-ed in The New York Times. His company offers employees four weeks of vacation starting in their first year. He does this because he believes that "the importance of restoration is rooted in our physiology." He credits a study done by researchers at Florida State University in which they looked at the performance of elite athletes, musicians and chess players, and found that the best performers practiced in intervals of 90 minutes. They often took breaks between sessions and hardly ever worked more than four and half hours a day. That's how you properly recover. This all goes back to the science of sleep. Many studies have shown that when the brain is relaxed, it focuses itself on boring but essential tasks, like etching in and memorizing the new skills you may have learned at the office during the week before. So, if you're struggling to keep up with the new software your company just introduced, right now might be the best time to take a vacation. Let your brain take some time to process the new information, and you might return in tip-top shape! 3. It's been proven that allowing your brain to day-dream allows you to better solve problems and be more creative. Your brain operates on two levels: One side is task-focused and the other side is focused on letting your mind wander and daydream. As you can imagine, a hard worker like you is pretty much always in the task-focused mode, overworking your brian to stay engaged on something you must finish for work, all the while taking in an overload of information (a 2011 study claims everyday we process 174 newspapers' worth of info!). As we mentioned above, taking a break is good for your brain. Because you have got to let your brain daydream. Daniel J. Levitin, the director of the Laboratory for Music, Cognition and Expertise at McGill University and the author of "The Organized Mind: Thinking Straight in the Age of Information Overload," told the New York Times that giving our brains time to wind down and think about nothing at all can provide "our moments of greatest creativity and insight." 4. Fact: The more (shorter) vacations you take, the happier you'll be. As far as vacations go, the more the merrier. A study done at Erasmus University in Rotterdam found that among about 1,500 Dutch adults in which 974 of them took a vacation, those who took time off were happier than those who did not, mostly because they were excited in anticipation for their vacation. They also showed signs of slightly increased happiness for two weeks after they returned from vacation. So, the trick for success, says the study's leader, Jeroen Nawijn, seems to be taking two or more short breaks spread out in the year rather than one massive vacation. Spread out that happiness! 5. In fact, you should try to take a vacation day every single week (if you can). Some researchers have argued that instead of offering employees a couple of long vacations every year, they should start providing employees with the option of taking a vacation every single week. A Harvard Business School study tracked employees for four years at a consulting group. Every year, the bosses insisted the employees take consistent time off. Those who took the time off committed to taking a break from work one day of the workweek, usually consisting of one full day off or a one night of uninterrupted personal time. After only five months, those who took the regular breaks from work reported being happier with their jobs and much prouder of the work they did at their job. 6. Your performance review this year could be higher if you just go take your vacation. All that happiness could pay off for you in major ways. An internal study done by the Ernst & Young accounting firm found that for each additional 10 hours that an employee took for vacation, his or her performance review was 8 percent higher the next year. Who knew that some rest and relaxation could get your your next raise? A survey by job recruiters at Korn/Ferry International discovered that 84 percent of over 250 executives have canceled a vacation due to pressures at work. That's shocking. If you're the head honcho, don't think it's impossible for you take a vacation. We know it's hard to break yourself away from your work, but you make the rules, after all, and it's proven that you'll be better and enforcing those rules if you give yourself a little break. Jennifer Deal, a researcher at the Center for Creative Leadership who has examined the way executives deal with taking vacations, told The Wall Street Journal that when bosses take time off they come back more creative and able to think about the long run future of the company better. If they don't take a break, she says it's extremely difficult for them to "see outside of the immediate whirlwind." Think of your vacation as a very relaxing and stress-free way to get some more work done. A study published in the US National Library of Medicine concludes that multicultural experiences help foster creativity and help generate ideas. However, this shouldn't be working abroad. The study emphasizes that the experience will only promote creativity when the situation doesn't call for "firm answers or existential concerns." 9. You might even get paid for taking time off. If you're still afraid, consider this: Some companies are paying their employees to get out of the office or they are removing restrictions to how much vacation time they can take off. The Wall Street Journal reports that FullContact, an advertising firm in Boston, began enticing its employees with a $7,500 incentive a year to help fund a nonworking vacation. Also, there's no limit on how long their vacation can be. And HubSpot, a marketing software company in Cambridge, Mass., has ordered a two week paid vacation minimum for its employees. Now that's a great work-life balance.